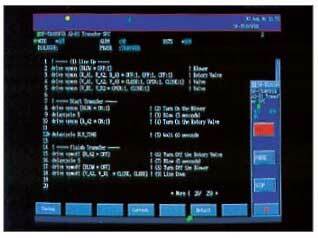 We have developed a new software package, Valve Pattern Monitor, for CENTUM CS. Valve Pattern Monitor is a function block which monitors the open/ close status of valves in a transfer system in a plant. Valve Pattern Monitor facilitates development of an application program for monitoring a valve's status and executing emergency stop actions in response to an abnormality in the valve's status. Process Control Systems Center, Industrial Automation Systems Division. Engineering Center, Industrial Automation Systems Division. For a transfer system in a plant, such as a transfer between tanks in a brewery, the transfer of pellets in a pneumatic transport system, or the transfer of oil at an offsite location, it is necessary to monitor the open/close status of valves or the on/off status of motors or blowers in reference to the transfer pattern (a combination of the transfer source(s) and destination(s), route, etc.). When a status error is detected, the emergency stop process, such as closing valves, must take place immediately. Until now, line-up control programs (sequence control such as opening and closing of valves) and line pattern monitoring programs have been separate application programs. Since there are many transfer patterns, and items to be monitored vary with each pattern, and since consideration must be given to maintaining synchronization and timing between sequence control and monitoring, creating the application program of a transfer system requires great effort. When transfer patterns change, both application programs for sequence control and monitoring must be changed which accordingly requires a large number of man-hours. The control procedure and monitoring of valves can be coded in a single application program. Operation output to a valve and status monitoring of the same valve are executed as a series of operations, allowing easy and thorough status monitoring. The alarm status of a function block can be monitored. 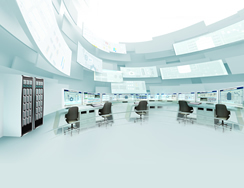 The control status of transfer systems over multiple field control stations can be easily monitored. The valve pattern monitor monitors valves, motors, etc. 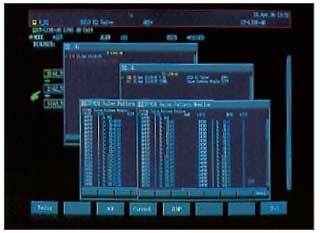 under Unit Supervision,1 a software package that implements the operation and control of a set of process equipment modules and instruments associated with a process unit, such as a reactor, as a unit. Figure 1 shows the structure of an application program using the valve pattern monitor. Unit Procedure is an application program that manages the phase (procedure) of a unit and is GIF- encoded as a sequential function chart (SFC). Unit Procedure in Figure 1 comprises three processes: lineup, transfer, and end. Operation is a program to execute the sequence for each phase in a unit procedure. The operation is realized as an SFC block2. The processing flow of an SFC block is encoded as an SFC, and the details of each phase of the SFC block are encoded in the Sequence and Batch-oriented Language (SEBOL). SEBOL is a sequence program language for process control. 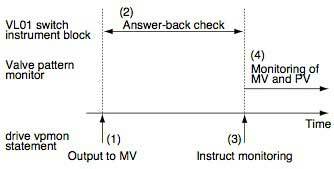 The flow of execution of the application program shown in Figure 1 will be described hereunder. The following numbers refer to the numbers in the figure. When the unit starts execution, the LINEUP operation for the first process, "lineup," is started. The operation, i.e., the SFC function block LINEUP, opens or closes the valves by the drive vpmon statements in a SEBOL block, and at the same time, it instructs the valve pattern monitor to monitor the valves. The valve pattern monitor monitors the status of the valves. If the valve pattern monitor detects an error in the valve status, it sends a signal to the unit. The currently executed operation in the unit receives that signal and executes the emergency stop process. An application program for operating the valve pattern monitor is encoded as SEBOL, the Sequence and Batch-oriented Language. The SEBOL statements for the valve pattern monitor are shown in Table 1. These statements instruct (register) and stop (delete) data monitoring, allowing the user to flexibly modify each pattern of data to be monitored. vpmstart Reserves the valve pattern monitor to enable data monitoring. drive vpmon Outputs data and then registers monitored data. drive vpmoff Deletes registration in the valve pattern monitor and then outputs data. vpmon Registers monitored data in the valve pattern monitor. vpmoff Deletes registration in the valve pattern monitor. vpmreset Deletes all registration in the valve pattern monitor. The drive vpmon statement is a statement that changes the output status of a switch instrument block or motor control block by activating its answer-back check and instructing the valve pattern monitor to monitor the data. The drive vpmon statement executes output to a valve or motor and monitoring of the status as a series of operations, so status monitoring is performed without a time gap. The following is an example of the drive vpmon statement to open the VL01 valve and instructs the valve pattern monitor to monitor the same valve. This valve is controlled by the VL01 switch instrument in the control station. Figure 2 shows the time chart of the operation with the drive vpmon statement–there is no time gap. The following numbers refer to the numbers in the figure. The drive vpmon statement outputs the value "2" (= open) to the MV data item (manipulated value) of switch instrument VL01. VL01 performs an answer-back check, which checks whether the PV (process value, i.e., the valve status) of VL01 has become "2" (= opened). When the answer-back check is done, the drive vpmon statement instructs the valve pattern monitor to monitor VL01. The valve pattern monitor starts monitoring the MV and PV of switch instrument VL01 immediately. When the valve pattern monitor detects that the MV or PV of the VL01 switch instrument is other than 2, it sends a signal notifying the unit of a valve error. As the parameter, "1" (from "2:1") that is defined in the drive vpmon statement is attached to this signal. There are two types of valve pattern monitors: one with an alarm check function, and one without it. A valve pattern monitor with an alarm check function can monitor the alarm status of a function block in addition to data such as the MV and PV. If the alarm status becomes other than normal (NR), the valve pattern monitor sends a signal to the unit. There are SEBOL statements for operations at the valve pattern monitor as shown in Table 1. These statements can specify a function block in a control station other than the station where the valve pattern monitor resides. 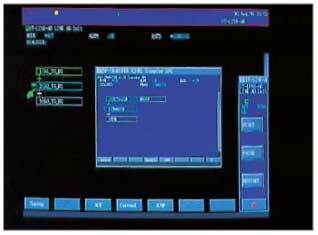 That is, the valve pattern monitor can monitor data in multiple field control stations without any special techniques. The following is an example of where the valve pattern monitor is used to transfer pellets (granular resin) between silos in a pneumatic transport system. It describes the procedure to transfer pellets from silo A2 to silo B1 in the process in Figure 3. Set up the transfer line (i.e., open or close the valves to establish a transfer line from silo A2 to silo B1). Carry out an air purge (for 5 seconds). Keep rotary valve R_A2 running for 60 seconds (to allow the pellets to be transferred). Shut off the line (i.e., close valves V_A2 and V_B1). Figure 4 shows the unit procedure and SFC block displayed on an operation and monitoring panel. The unit procedure comprises three phases: A1_TO_B1 (transfer from silo A1 to silo B1), A2_TO_B1, and A3_TO_B1. The SFC block that executes A2_TO_B1 is displayed in a "half-size" screen. The second phase in the SFC block, TRANSFER, transfers the pellets between silos. This SFC block also has an emergency stop program, EMSTOP, for executing the signal process. Pause the valve pattern monitor. Output an operator guide message with an opeguide statement. In this emergency stop process, no instruction is given to the valve pattern monitor and the valves are operated by the drive statement only for generating output with an answer-back check. Figure 7 shows the state where valve V_B2 is opened during a pneumatic transfer and the valve pattern monitor detects this as an error. The two upper "half-size" screens (entitled .OG and .AL) show an operator guide mess age and the process alarm messages found using the unit name as the search key. 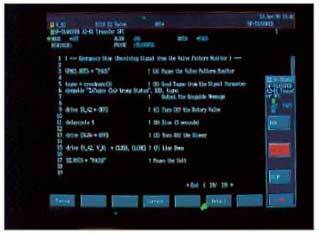 The operator guide message output by the emergency stop process with the opeguide statement and a valve pattern discrepancy alarm (VPTN) from the valve pattern monitor are displayed. The two lower "half-size" screens show the settings of data item ENTRY that represents the data monitored by the valve pattern monitor. The error code "D001" that denotes a discrepancy in a valve pattern is displayed on the sam e line with the problematic data, identifying the status of valve V_B2 as abnormal. The valve pattern monitor allows sequence control for opening and closing valves and monitoring line setup patterns implemented through a single application program. With the valve pattern monitor, no consideration is required for synchronization and timing between control and monitoring when creating such an application program. That is, the valve pattern monitor makes program development easy, shortens the time period for development as well as aids in debugging. Furthermore, the opening/closing and monitoring of a valve are encoded as a series of contiguous operations, allowing the user to easily set up highly reliable line monitoring. In addition, the valve pattern monitor can monitor data of multiple field control stations, so it can be used in large plants. Kano, T., et al. "Unit Supervision," New Software Package for CENTUM CS.—Yokogawa Technical Report, English Edition No. 21, 1996, pp. 9 to 12. Ito, H., et al. "SFC Block," A New Function Block for CENTUM CS.—Yokogawa Technical Report, English Edition No. 21, 1996, pp. 5 to 8.